"Chosroes" redirects here. For other uses, see Khosrau (disambiguation). He was the son of Hormizd IV (reigned 579–590) and the grandson of Khosrow I (reigned 531–579). 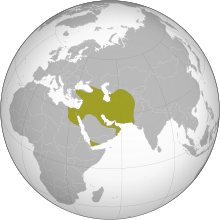 Khosrow II was the last king of Persia to have a lengthy reign before the Muslim conquest of Iran, which began five years after his death by execution. He lost his throne, then recovered it with Roman help, and, a decade later, went on to emulate the feats of the Achaemenids, conquering the rich Roman provinces of the Middle East; much of his reign was spent in wars with the Byzantine Empire and struggling against usurpers such as Bahram Chobin and Vistahm. Khosrow II was born in c. 570; he was the son of Hormizd IV and an unnamed noblewoman from the House of Ispahbudhan, one of the Seven Great Houses of Iran. Her brothers, Vinduyih and Vistahm, were to have a profound influence in Khosrow II's early life. Khosrow's paternal grandfather was the famed Sasanian shah Khosrow I Anushirvan (r. 531–579), whilst his paternal grandmother was the daughter of the khagan of the Khazars. Khosrow is first mentioned in the 580s, when he was at Partaw, the capital of Caucasian Albania. During his stay there, he served as the governor of the kingdom, and managed to put an end to the Kingdom of Iberia and make it into a Sasanian province. Furthermore, Khosrow II also served as the governor of Arbela in Mesopotamia around this period. Map of the Roman–Persian frontier during Late Antiquity, including the 591 border between the two empires. In 591, Khosrow moved to Constantia, and prepared to invade the Sasanian controlled part of Mesopotamia, while Vistahm and Vinduyih were raising an army in Adurbadagan under the observation of the Byzantine commander John Mystacon, who was also raising an army in Armenia. After some time, Khosrow along with the Byzantine commander of the south, Comentiolus, invaded Mesopotamia. During this invasion, Nisibis and Martyropolis quickly defected to them, and Bahram's commander Zatsparham was defeated and killed. During the same period, Khosrow, feeling disrespected by Comentiolus, convinced Maurice to replace the latter with Narses as the commander of the south. Khosrow and Narses then penetrated deeper into Bahram's territory, seizing Dara and then Mardin on February, where Khosrow was re-proclaimed king. Shortly after this, Khosrow sent one of his Iranian supporters, Mahbod, to capture Ctesiphon, which he managed to accomplish. In 622, despite the major progress the Sasanians were making in the area of the Aegean Sea, the Byzantine Emperor Heraclius was able to take the field with a powerful force. In 624, he advanced into northern Adurbadagan, where he was welcomed by Farrukh Hormizd and his son Rostam Farrokhzad who had rebelled against Khosrow. 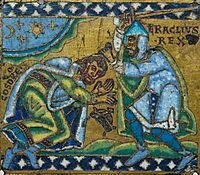 Heraclius then began sacking several cities and temples, including the Adur Gushnasp temple. After the capture of Dastagird, the son of Khosrow, Kavad, was released by the feudal families of the Sasanian Empire, which included: The Ispahbudhan spahbed Farrukh Hormizd and his two sons Rostam Farrokhzad and Farrukhzad. Shahrbaraz of Mihran family, the Armenian faction represented by Varaztirots II Bagratuni, and finally Kanadbak of the Kanārangīyān family. 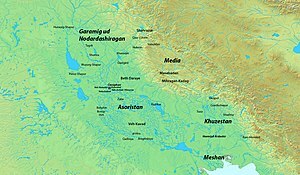 On 25 February, Kavad, along with Aspad Gushnasp, captured Ctesiphon and imprisoned Khosrow II. Kavad II then proclaimed himself as king of the Sasanian Empire, and ordered Piruz Khosrow to execute all his brothers and half-brothers, which included Mardanshah, the favorite son of Khosrow II. Three days later, Kavad ordered Mihr Hormozd to execute his father (some sources state that he was shot to death slowly with arrows). With the support of the Persian nobles, Kavad then made peace with the Byzantine emperor Heraclius, which made the Byzantines regain all their lost territories, their captured soldiers, a war indemnity, along with the True Cross and other relics that were lost in Jerusalem in 614. Heraclius then returned in triumph to Constantinople, while the Sasanian Empire sank into anarchy from the greatness it had reached ten years earlier. Umayyad Caliphate coin imitating Khosrau II. Coin of the time of Mu'awiya I ibn Abi Sufyan. BCRA (Basra) mint; "Ubayd Allah ibn Ziyad, governor". Dated AH 56 = 675/6 AD. Sasanian style bust imitating Khosrau II right; bismillah and three pellets in margin; c/m: winged creature right / Fire altar with ribbons and attendants; star and crescent flanking flames; date to left, mint name to right. Islamic tradition further states that Khosrow II tore up Muhammed's letter saying, "A pitiful slave among my subjects dares writes his name before mine"  and commanded Badhan, his vassal ruler of Yemen, to dispatch two valiant men to identify, seize and bring this man from Hijaz (Muhammad) to him. When Abdullah ibn Hudhafah as-Sahmi told Muhammad how Khosrow had torn his letter to pieces, Muhammad promised the destruction of Khosrow II stating, "Even so, Allah shall destroy his kingdom." Khosrow was the son of Hormizd IV, and an unnamed Ispahbudhan noblewoman who was the sister of Vistahm and Vinduyih. Khosrow also had two cousins from the Ispahbudhan family whom were named Mah-Adhur Gushnasp and Narsi. He had a brother-in-law named Hormuzan, a Sasanian nobleman from one of the seven Parthian clans, who later fought against the Arabs during the Muslim invasion of Persia. However, this is most likely wrong since Kavad's mother was a Byzantine princess named Maria. Khosrow married three times: first to Maria, a daughter of the Byzantine emperor Maurice, who bore him Kavad II. Then to Gordiya, the sister of Bahram Chobin, who bore him Javanshir. Then to Shirin, who bore him Mardanshah. Khosrow also had other children whom were named: Borandukht, Azarmidokht, Shahriyar and Farrukhzad Khosrow V. All these persons except Shahriyar would later become the monarch of Persia during the Sasanian civil war of 628-632. Khosrow had a brother named Kavad and a sister named Mirhran, who was married to the Sasanian spahbed Shahrbaraz, and later bore him Shapur-i Shahrvaraz, while Kavad married an unnamed woman who bore him Khosrow III. Wikimedia Commons has media related to Khosrau II. ^ a b c d e f g h i Howard-Johnston 2010. ^ Shahbazi 2004, pp. 466-467. ^ Hansman 1986, pp. 277-278. ^ a b c d e Shapur Shahbazi 1989, p. 180–182. ^ Pourshariati 2008, pp. 127–128, 131–132. ^ Greatrex & Lieu 2002, p. 172. ^ Ferdowsi in Shahnameh affirms the same conditions put forth by Maurice. ^ a b c Greatrex & Lieu 2002, p. 173. ^ Greatrex & Lieu 2002, p. 174. ^ a b Crawford 2013, p. 28. ^ Pourshariati 2008, pp. 131–132. ^ Pourshariati 2008, pp. 132, 134. ^ Pourshariati 2008, pp. 132–133, 135. ^ Pourshariati 2008, pp. 133–134. ^ Pourshariati 2008, pp. 136–137. ^ Peter Brown: The Rise of Western Christendom. 2. erweiterte Auflage. Oxford 2003, S. 283. ^ a b Frye 1983, p. 166. ^ Frye 1983, p. 171. ^ Frye 1983, p. 172. ^ Landau-Tasseron, Ella. "ḎŪ QĀR". ENCYCLOPÆDIA IRANICA. Retrieved 8 January 2012. ^ Richard Nelson Frye, The History of Ancient Iran, p 330. ^ Pourshariati 2008, pp. 153–154. ^ Soudavar, Abolala. "Looking through The Two Eyes of the Earth: A Reassessment of Sasanian Rock Reliefs" (PDF). www.soudavar.com. ^ Pourshariati 2008, pp. 152–153. ^ Kaegi 2003, p. 140. ^ a b "Chapter 42: The Events of the Seventh Year of Migration". ^ a b Kisra, M. Morony, The Encyclopaedia of Islam, Vol. V, ed.C.E. Bosworth, E.van Donzel, B. Lewis and C. Pellat, (E.J.Brill, 1980), 185. ^ Mubarakpuri, Safiur-Rahman. WHEN THE MOON SPLIT. Darussalam. ISBN 978-603-500-060-4. ^ Pourshariati 2008, p. 179. ^ electricpulp.com. "HORMOZĀN – Encyclopaedia Iranica". ^ Pourshariati 2008, p. 236. ^ Pourshariati 2008, p. 205. Meyer, Eduard (1911). "Chosroes" . In Chisholm, Hugh. Encyclopædia Britannica (11th ed.). Cambridge University Press. Baca-Winters, Keenan. From Rome to Iran: Identity and Xusro II. PhD. diss., University of California, Irvine, 2015. Edward Walford, translator, The Ecclesiastical History of Evagrius: A History of the Church from AD 431 to AD 594, 1846. Reprinted 2008. Evolution Publishing, ISBN 978-1-889758-88-6. — a primary source containing detailed information about the early reign of Khosrow II and his relationship with the Romans. Greatrex, Geoffrey; Lieu, Samuel N. C. (2005). 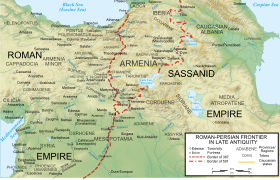 The Roman Eastern Frontier and the Persian Wars AD 363-628. Routledge. ISBN 978-1-134-75646-9. Howard-Johnston, James (2010). "ḴOSROW II". Encyclopaedia Iranica, Online Edition. Retrieved 9 November 2013. Kia, Mehrdad (2016). he Persian Empire: A Historical Encyclopedia [2 volumes]: A Historical Encyclopedia. ABC-CLIO. ISBN 978-1-61069-391-2. Kaegi, Walter Emil (2003). Heraclius: Emperor of Byzantium. Cambridge, United Kingdom: Cambridge University Press. ISBN 0-521-81459-6. Crawford, Peter (2013). The War of the Three Gods: Romans, Persians and the Rise of Islam. Pen and Sword. ISBN 978-1-84884-612-8.